Marijuana is coming to the Michigan electoral ballot this November, and we have been getting questions daily from medical marijuana clients and prospective marijuana business owners about what the ballot initiate says, what makes it different than the current law, and how they can prepare their business for the law’s eventual passage. 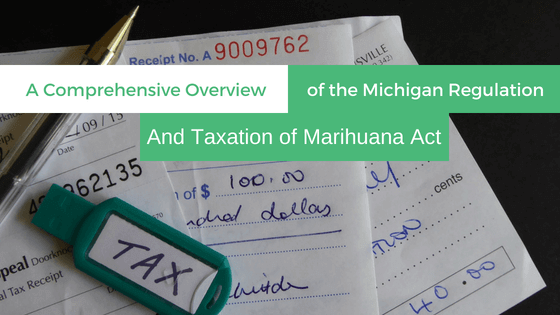 With the ballot expected to pass by a wide margin, it is important for Michigan business owners to know what the ballot initiative says and how it will affect the state’s Marijuana industry. On the macro level, the RMLA has 4 main objectives: it allows the personal possession and use of marijuana by anyone 21 years of age or older; provides for the lawful cultivation and sale of marijuana and industrial hemp by anyone 21 years of age or older; permits the taxation of revenue from running a commercial marijuana business; and outlines certain penalties for violations of the Act. The RMLA does not replace the state’s medical marijuana laws but instead provides a second regulatory structure for recreational Marijuana. For example, a person between the ages of 18 and 20 could possess medical marijuana with a valid medical card; but that same person could not possess recreational marijuana until they turn 21. In addition, different tax rates apply depending on whether its medicinal—in which case there is a 3% excise tax—or if its recreational—in which case there is a 10% excise tax. Much like the end of Prohibition and legalization of alcohol, the Act seeks to eliminate criminal penalties for the personal possession and cultivation of marijuana by adults; removes the distribution of marijuana from the criminal market; prevents marijuana revenue from going to criminal enterprises or gangs; seeks to prevent the distribution of marijuana to anyone under 21 years of age; ensures the safety of marijuana and marijuana-infused products; and ensures security of marihuana establishments. The Act goes on to effectively eliminate the penalties for anyone who possesses, uses, purchases, transports, or processes 2.5 ounces or less of marijuana, or up to 15 grams of marijuana concentrate. The Act does expand this limit to possession of no more than 10 ounces of marijuana within a residence, and authorizes the cultivation of no more than 12 plants per household. The Act also states that the possession, use, or sale of marijuana shall not affect an individual’s custody or visitation rights with their minor children unless that behavior creates an unreasonable danger to the child that can be substantiated. In addition to legalizing Marijuana, the Act also legalizes the cultivation, possession, processing and transportation of industrial hemp and gives LARA the authority to issue rules for the regulation of commercial hemp. Presently, hemp can only be grown in Michigan for research purposes with a special license issued by LARA. At the time this article was written, no entity has ever been issued a hemp license by LARA but this is expected to change with the passage of the Act. Much like the current Medical Marihuana Facilities Licensing Act (MMFLA), a municipality does have the option to completely prohibit or limit the number of marihuana establishments within its boundaries under the RMLA. If a municipality does allow marijuana commercial businesses within their municipal limits, they do have certain powers and restrictions given to them under the Act. A municipality may establish reasonable restrictions on public signs related to marijuana establishments. A municipality also has the power to regulate the time, place, and manner of operation of marijuana establishments and of the production, manufacture, sale, or display of marihuana accessories. A municipality may also enact ordinances that authorize the sale of marijuana for consumption in designated areas that are not accessible to anyone under 21 years of age (like a marijuana bar), or at special events in limited areas and for a limited time (such as a wedding). A municipality may also impose penalties for violations of these possible ordinances, however, the Act limits such penalties to only a civil infraction, subject to a civil fine of not more than $500. In order to provide a financial incentive to municipalities who allow such facilities, the RMLA allows each municipality to charge an annual fee of up to $5,000 per marijuana business to subsidize the administrative and enforcement costs associated with the operation of marijuana establishments in their town. In a similar manner as the MMFLA, the RMLA allows for the same five license types – grower, processor, provisioning center/dispensary, secured transporter and safety compliance center – and adds a sixth type, called a microbusiness. In regards to notable changes under the RMLA, the Act does modify the number of plants each subcategory of grower can cultivate. Under the RMLA, a Class A marijuana grower may cultivate no more than 100 marijuana plants; Class B marihuana growers no more than 500 marihuana plants; and Class C marijuana growers are expanded to 2,000 marihuana plants. Another major change with the RMLA is the addition of microbusinesses, which we’ve talked in detail about in our prior posts . This business license type allows for an individual to grow, process, and sell marijuana under one license. The addition of this license type provides an avenue for caregivers and smaller-scale operations to break into the recreational marijuana industry. This license type would also the small-scale cultivation and selling of unique craft strains of marijuana and processed goods direct to the consumer. The Department of Licensing and Regulatory Affairs (LARA) will be charged with creating rules and procedures governing the application process, fees, and requirements for holding a license. As LARA currently has a process in place for medical marijuana facilities under the MMLFA, it is expected that many of these rules and procedures will be very similar to the current structure. (3) will hold an ownership interest in more than 5 marihuana growers or in more than 1 marihuana microbusiness, unless LARA promulgates a new rule stating otherwise after 2023. Similar to the MMFLA, all state licenses are effective for only 1 year, and all renewals require a complete application and a renewal fee. The marijuana business must be in good standing to renew its license. In addition to all other taxes that may be added to the marijuana industry, the RMLA specifically imposes a 10% excise tax on each marijuana retailer and each marijuana microbusiness. This tax is imposed on the sale of marijuana to anyone other than another marijuana business. This tax will be put into a state fund, which will first be used for the implementation, administration, and enforcement of the Act, and for at least two years, to also provide $20 million annually to one or more clinical trials researching the efficacy of marijuana in treating the medical conditions of armed services veterans and preventing veteran suicide. (d) 35% to the Michigan transportation fund to be used for the repair and maintenance of roads and bridges. The RMLA does prescribe certain sentencing guidelines for violations of the Act. Generally, if an individual violates the Act and cultivates more plants or has more marijuana in their possession than allowed by the Act, they will be subject to a civil infraction, fines of up to $500.00, community service, forfeiture of the marijuana and attendance at drug education or rehabilitation programs. So what doesn’t the RMLA cover? The RMLA does not authorize driving, operating, navigating, or being in physical control of any motor vehicle, aircraft, snowmobile, off-road recreational vehicle, or motorboat while under the influence of marijuana. Further, it does not allow the sale of marihuana or marihuana accessories to a person under the age of 21, or allow any person under the age of 21 to possess, consume, purchase or otherwise obtain, cultivate, process, transport, or sell marihuana. The RMLA also does not allow the cultivation of marijuana plants if the plants are visible from a public place, or if the marijuana plants are outside of an enclosed and secured area, equipped with locks or other functioning security devices that restrict access to the area. Much like alcohol, the RMLA prohibits possessing marihuana accessories or possessing or consuming marihuana on the grounds of a public or private school where children attend classes in preschool programs, kindergarten programs, or grades 1 through 12, in a school bus, or on the grounds of any correctional facility. Additionally, the Act does not require an employer to permit the possession, cultivation or use of marijuana in any workplace or on the employer’s property. The RMLA does not prohibit an employer from disciplining an employee for violation of a workplace drug policy or for working while under the influence of marijuana, and does not prevent an employer from refusing to hire, discharging, disciplining, or otherwise taking an adverse employment action against a person with respect to hire, tenure, terms, conditions, or privileges of employment because of that person’s violation of a workplace drug policy or because that person was working while under the influence of marijuana. The RMLA is a comprehensive piece of legislation that ends the prohibition on marijuana use and possession and provides a myriad of opportunities for entrepreneurs to enter this booming industry. If you are thinking about starting a Michigan marijuana business or have questions about the RMLA, we suggest you contact a Michigan medical marijuana attorney to get a head start on this process before the ballot initiative passes.